At the Age of 37 Years and 18 Days. The poet and singer of the above lines fully knew the uncertainty of life when he wrote these words, which also prove true in the death of George Schollie, who died suddenly on Thursday, March 15, 1928, at the age of 37 years and 18 days. He had complained for some time but no one thought of his sudden end which came to him at his home near Knob Noster, Mo. The funeral was held last Saturday, March 17, from the house of mourning. Services were held in the home and in St. Paul’s Lutheran church in Concordia at which Rev. Domsch and Rev. F. Brust preached consoling sermons. The choir of St. Paul’s sang songs of hope and faith, and after the body was viewed by those present, it was laid to rest in the St. Paul’s cemetery to await the time when the Lord shall bid it to come forth. The pallbearers were: George Lohoefener, Andrew Gieseke, Theodore Michaelis, Henry Wilkens, Chris Eckhoff and Wm. Miller. The flower carriers were: Frieda Lueck, Leona Lueck, Anna Marie Lueck and Ella von Holten. 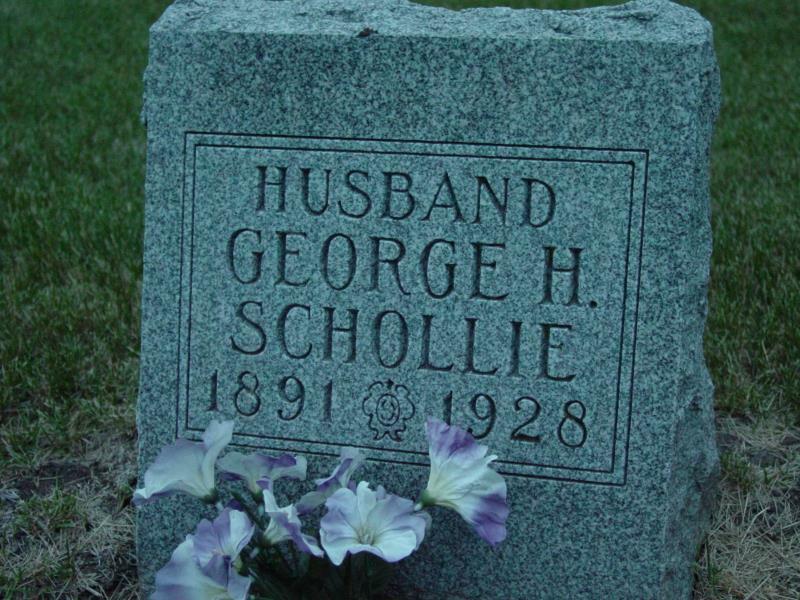 George Henry Schollie, born at Alma, Mo., February 26, 1891, was a son of Mr. and Mrs. William Schollie. (His father and brother preceded him in death.) He married Martha E. Marth, daughter of Mr. and Mrs. Frank Marth, on February 26, 1914. The union was blessed with four children: Edna, 12 years old; Nora, 9 years; Vanita, 6 years, and Dorothy, 2 years, all at home. Besides his wife and children, he leaves his mother, Mrs. Lizzie Hinck of Emma, Mo., three half brothers: Henry W. Hinck of Sweet Springs, Mo. ; Wm. F. Hinck of Sweet Springs, Mo. ; and Otto C. Hinck of near Concordia, Mo. ; two half sisters: Dora S., Mrs. Lambert Hemme, at Emma, Mo., and Mary, Mrs. Adolph Eckhoff of Sweet Springs, Mo., and many other relatives and friends. His stepfather died June 6, 1927, at Emma, Mo. The mourners have our deepest sympathy in their great loss of a providing husband and father, friend and neighbor. George Schollie was my g-grandfather. He was born George Scholle, and apparently changed the spelling of his surname early in adulthood.